We are born into stories - they shape our hopes and fears, what we believe to be possible, the kind of lives we end up leading. There are stories about power - about nations, communities, and belonging. There are stories about who is weak, and who is strong, and about what to do to make the world better. There are stories about exclusion and inclusion - about who is “worthy”, and who should be avoided, about who is brave, and who is to blame. There are stories about how to be happy - about getting and keeping things (and perhaps sharing a little with someone else). And there are stories about what to do with our own pain - how to slay dragons and win prizes, how to get ahead, stay on top, to protect ourselves from the world. We may be unconscious of these stories, much of the time. Many of these stories aren’t true, and aren’t helpful. When our stories based on the idea that we can avoid suffering, that we should hold ourselves at arms’ length from each other, from the earth, perhaps even from love itself, they don’t work. But there is a new story, or at least a better way of telling an old one - a story based on coming together, not pushing apart; a story in which we accept that some suffering is inevitable in every life, but that none of us has to carry our burdens without support; a story in which we are privileged to partner with each other, with the world around us, and with love itself. Most importantly, it’s a story in which human beings are not the protagonists. Instead, we are each taking our place in something like a play with a huge cast: think of it as the largest Broadway show ever produced, and it’s called the story of the evolution of love. You have your part, I have mine, and we all need each other to make it work. 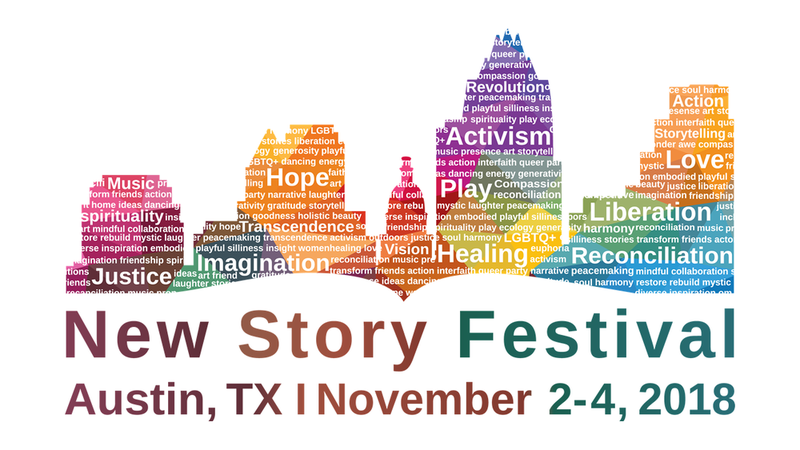 The New Story Festival is a space in which we can experiment with living out the story together. With music and ideas, silence and contemplation, action for the common good, laughter and tears - a place where we can take life seriously without taking ourselves too seriously. We invite you to join us.